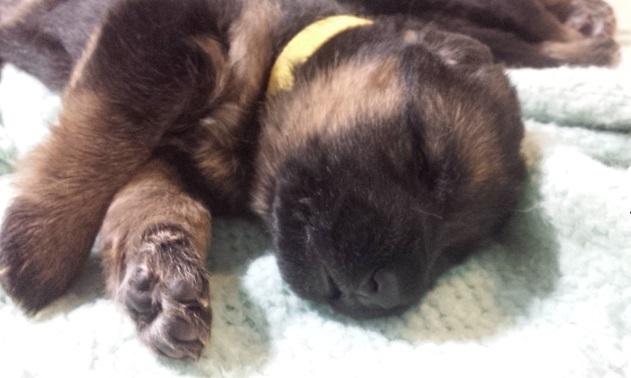 Home → GSD FAQs → Should I Let My German Shepherd Puppy Sleep in Bed With Me? Choosing to let your adult German Shepherd Dog sleep with you is your own decision and there are many benefits to doing so. However, you should know that as a puppy the best thing you can do for them is completely ignore unwanted behavior. My first German Shepherd was Fina. Fina was an amazing, friendly dog. I made one huge mistake with her when I first got her. I brought her home and she was separated from the other pups and her mom and I was crate training her. At night, she whined, and I felt bad, so I slept on the ground near her crate, allowing her to chew on my finger. This was a huge mistake and lead to a lifetime of severe separation anxiety. Never, ever give in to a puppy’s whining. You can sleep with your cuddly puppy, but do not do it to appease them. If you are crate training them, they are going to whimper and whine. I raised pups before, and the mom would sit nearby, away from the pups, totally ignoring any whimpers as if she were 100% deaf. It was amazing and fascinating to watch. I had heard “ignore the bad” 1,000 times, but to see it in action was very eye opening. I have crate trained multiple puppies. I put their crates in my bedroom, right beside the bed. Once that door closes, they begin whining and howling. At this point there is no turning back. NEVER try to calm them down. NEVER yell at them. NEVER do anything positive or negative. At this point you need to plug your ears and wait it out. They will stop. In general, the first night they will whine 20 minutes. The second night they will whine 15 minutes. The third night they will whine 10 minutes. The fourth night they will whine 5 minutes. Basically, if you deal with 1 hour of whining, you could save yourself 13 years of major behavioral problems. Should my German Shepherd sleep in my bed? This is a question that’s up to you and whoever you share your bed with now and in the future. If your dog is safe and you like them in your bed and aren’t worried about the hair and dirt, go ahead and ave them jump into bed with you. There are some negatives but the pros outweigh the cons for many people. For further reading, check out this scientific study: A Multispecies Approach to Co-Sleeping. Does your dog sleep with you? Please comment below with your stories about dogs sleeping in your bed. Manifest Episode 1 "Pilot" - Were the German Shepherds Talking?